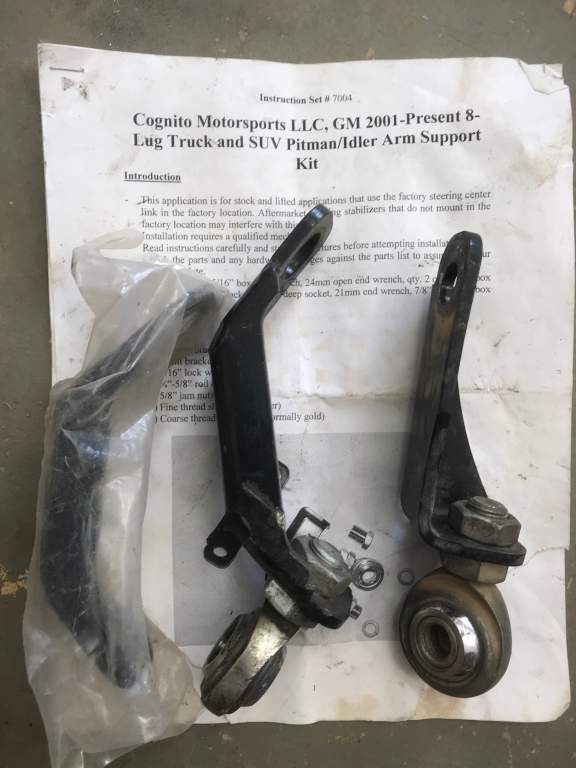 I have a used Cognito Pitman/Idler arm support kit for sale. It was on the truck for 4k miles or so before the kit was removed. Included is a second bracket that is brand new (in plastic). 2009 GMC Sierra 2500HD LMM 4X4 Crew Cab LTZ. DVD, Nav, 18K Pull-Rite Super-Glide. 2006 Duramax LBZ 4X4 Crew Cab LT3 with the Allison 6. Cognito 4-6" lift set around 4" with Bilsteins, 305 65 17 Pro Comp Xtreme AT on Cepek DC-1 Chrome 17X9 w/ 4.5" BS. Nfab 6 step bars, Neucleus iPod adapter,Hella back up lights wired to cargo switch, Firestone Air Bags and Pull Rite 5th wheel hitch.